Successful coaches enable others to be the agent of change in their own lives instead of simply dealing with unintended outcomes. This is the heart of iPEC's exclusive Core Energy Coaching™ process, which empowers you to consciously choose your actions, create the things you most want to experience in life, and help others to do the same for themselves. Nearly all coach training schools focus on teaching traditional coaching methods that help individuals, couples, groups, or organizations to clarify goals, create action plans, and be accountable to them. iPEC’s unique Core Energy Coaching™ process goes much further to uncover inner blind spots and cultivate new perspectives which support individual success on a sustainable level. Our methodology empowers people to dig deeply, honestly, and objectively into their energy and mental programming in order to assess who they are and who they want to become. With Core Energy Coaching™ techniques and tools, you'll support your clients as they establish and achieve new goals, raise their level of consciousness, and open up new possibilities that were previously hidden from sight. This is how people step into new versions of themselves, make connections, become catalysts for culture shifts within their workplaces, and increase the joy and positivity in every aspect of their lives. Coaching methodologies that are action oriented (focused on goals, steps, and accountability) can be extremely effective in the short run while a person’s enthusiasm and energy are running high. Unfortunately, their ability to sustain the outcome and repeat the process usually deteriorates over time. This is a symptom of underlying energy and mindset inhibitors. Your coursework intuitively trains you to engage people, helping them become more productive, happier, and fulfilled in their careers and lives. You’ll learn how to inspire and motivate others to do what they previously felt incapable of doing. This isn’t a linear process but a highly creative one with the coach and client partnering together. At all stages of the process, the client takes the lead—choosing their experiences they'd like to have in life, giving permissions for inner shifts to take place, and providing the wisdom and answers that best serve their goals. As a Core Energy Coach, you will be there to facilitate the process of your clients uncovering their own brilliance and unlocking their infinite potential. Is Core Energy Coaching backed by research? Is there a way to validate the success of this coaching model? In fact, there is. iPEC has developed a proprietary, research-backed tool called the Energy Leadership™ Index or ELI. It’s an online assessment that measures how an individual perceives and approaches work and life. The ELI is an attitudinal assessment, not a personality-based one and it measures the energy levels a person is experiencing under both normal and stressful circumstances. As an iPEC graduate, you have exclusive access to this powerful business and credibility-building tool that enables you to provide TANGIBLE data. At the appropriate intervals in each coaching engagement, your clients can take the assessment and uncover measurable results in the form of a full report, which offers value on both a personal and organizational level. This visible data makes it so much easier for them to see where to make necessary changes. It’s also easier for you to explain how your work together will make a tremendous difference in how they experience life and navigate toward their goals. You’ll also be able to show the tangible return on investment for any coaching engagement. How is the training for Core Energy Coaching delivered? Your training is structured around three, 3-day, in-person modules positioned about twelve weeks apart. You will NOT be forced to sit through a dull classroom experience but rather, you’ll have an opportunity to practice your skills in a supportive environment, get immediate feedback, and build invaluable relationships with other students in the program. 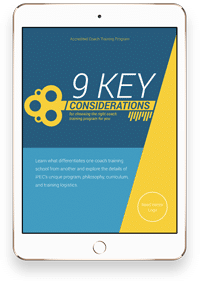 You may find other coach training programs downplay the importance of live trainings in order to cut costs or reduce overall training time. At iPEC, we believe that in-person training is integral to your success as a student and later, as a coach. Learning in our program is done in a holistic, guided way, rather than sending you off to learn the material on your own. In between your live trainings, you’ll apply and integrate what you’ve learned with webinars that introduce new material and expand on previously learned concepts. You will also work with others as a peer coach, a peer client and part of a peer group, on a weekly basis. Additionally, we offer a niche specialty training to help you target and develop skills in your chosen area of expertise. You’ll have plenty of opportunity for self-study, which provides you with yet another component of our robust training, in a way that fits your lifestyle.